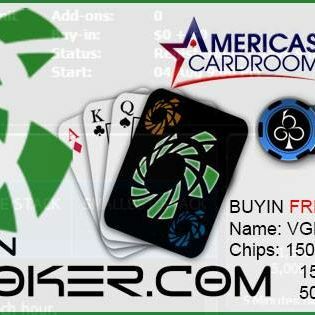 VGN – Virtual Gamers Network shared VGN Poker’s event. VGN Poker Opener #2 Freeroll – August 11th 2017 @ 9:00 PM est. Well our first VGN Poker Opener last week did go off. Between server issues and other thing happening it was difficult. On the bright side of things however we did have 290 entrants and an additional $10.00 was added to the prize pool from buy-ins. Unfortunately there was no time to get bounties up but we are offering everyone who placed top 10 last week 1.00 to be added to their ACR or Black Chip Account. All players will have to do is contact support. This week we will actually get our stream broadcast off the ground and will have bounties setup and put out their on time. Sorry for any of the confusion that this might have caused anyone but thats why we are having these opener tournaments. To get systems optimzed and an effective method of giving you guys the best entertainment possible. I look forward to seeing everyone in this Fridays VGN Poker Opener #2 and am hoping we have just as good if not better of a turnout then we did last week. See you all soon.